HIM: Uhm… I can’t remember. Maybe a fiver? I’ll be honest, that ‘maybe’ bit worries me. So does the fiver bit. So does the fact that the thistles are stuck on with some sort of plasticky stuffy. So does the fact that we already have a complete set of twee Scottish shot glasses gathering dust in the china cabinet, albeit with Rennie MacKintosh etched roses instead of sticky-on thistles. But I console myself that one or two runs through ‘his’ dishwasher, and these shot glasses won’t be nearly as thistley as they are now. 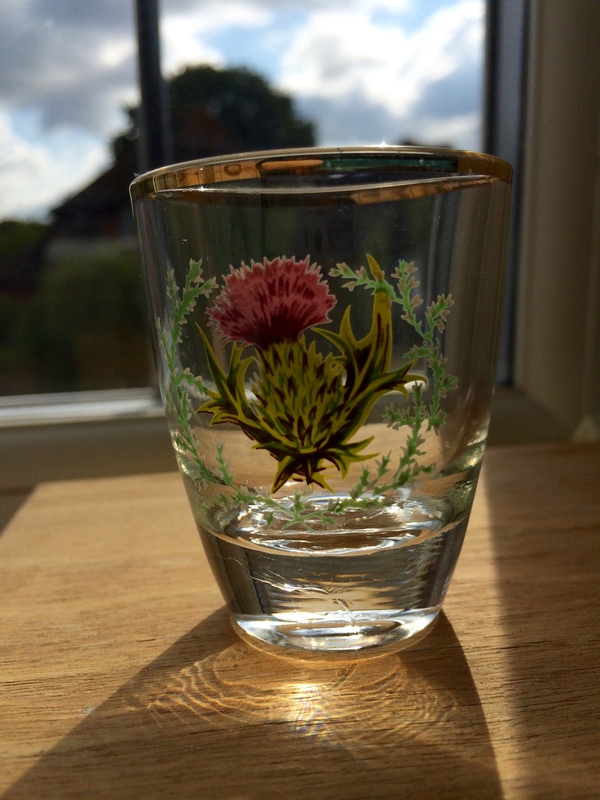 And it is very sweet that the reason he decided to seek these out to bid on was that the shot glass he uses to make me martinis with (he does make the best martinis ever…) went into the dishwasher and never came back out again. In the interests of balance, I try to think of all the positives about shopping on eBay. For one thing, by buying this stuff up and shoving it our cupboards and under the beds, my husband is doing his bit to help reduce the growing problem of landfills in the English countryside. Then there is reducing carbon emissions and underwriting the Post Office to consider. Because I am quite sure the main reason most of this stuff appears on eBay is that the sellers live nearer to the post office than they do the tip. Of course, out there somewhere today there is another husband and wife discussing these very same shot glasses over their tea and toast. They may even be holding the broken one up to the light and reminiscing about how it got smashed. He is saying I TOLD YOU SO, and she is having to admit she was wrong to say he had lost his mind if he thought anyone was going to bid on (a) a set of three shot glasses, and (b) particularly these ones. Oh, how he must have laughed when he ran to tell her she was wrong, that someone out there not only was wiring them a picture of the queen in exchange for these shot glasses – but they even get to keep the broken one! Meanwhile, back at our house, I can’t help wondering what kind of shots these glasses were designed for? My husband suggested whisky, but does anyone ever do whisky shots? Drambuie maybe? Or Columba Cream? As I finish typing this, Gordon walks in and asks what I’m up to. I read him the post, and he laughs, before telling me I’ve left out the most important detail. ME: What detail is that? HIM: I’m currently the top bidder on a set of three Buffy shot glasses!